When you have anxiety or depression, exercise often seems like the last thing you want to do. But once you get motivated, exercise can make a big difference. Exercise helps prevent and improve a number of health problems, including high blood pressure, diabetes and arthritis. Research on anxiety, depression and exercise shows that the psychological and physical benefits of exercise can also help reduce anxiety and improve mood. The links between anxiety, depression and exercise aren’t entirely clear — but working out and other forms of physical activity can definitely ease symptoms of anxiety or depression and make you feel better. 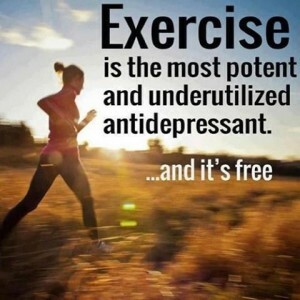 Exercise may also help keep anxiety and depression from coming back once you’re feeling better. Physical activity is any activity that contracts muscles and expends energy and can include work or household or leisure activities. You don’t have to do all your exercise or other physical activity at once. Broaden how you think of exercise and find ways to add small amounts of physical activity throughout your day. For example, take the stairs instead of the elevator. Park a little farther away from work to fit in a short walk. Or, if you live close to your job, consider biking to work.